For starters, the Chromebook Pixel has a 12.85-inch, ultra high resolution 2,560 x 1,700 display. Google says it is the highest resolution display ever to be put in a laptop. What they mean, however, is that it has the highest pixel density of 239 ppi. The 13 and 15-inch MacBook Pro with Retina display in comparison have a pixel density of 227 and 220 respectively, although the latter has a higher, 2,880 x 1,800 resolution display. Two interesting aspects about this display are that it has an unconventional 3:2 aspect ratio, which is designed to give you more vertical screen real estate to facilitate web browsing. The second thing is that the display is actually a touchscreen, a first for a Chromebook. The panel also uses a Corning Gorilla Glass for protection. Google also has gone to great lengths to give the Chromebook Pixel the level of polish and attention to detail appropriate for a high-end device. The body is made out of anodized aluminum. The ventilation grilles are hidden, as are the screws and the stereo speakers, which are placed underneath the backlit keyboard. The glass trackpad has been etched using a laser microscope to give it that desired level of friction. 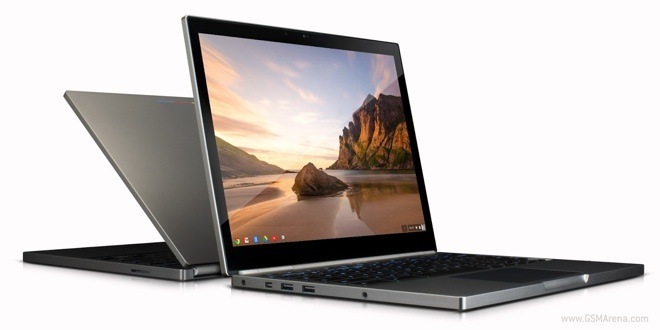 In terms of hardware, the Chromebook Pixel runs on a dual-core 1.8GHz Intel Core i5 processor with integrated Intel HD 4000 graphics, 4GB of DDR3 RAM, 32GB/64GB SSD, dual-band WiFi 802.11a/b/g/n 2×2, Bluetooth 3.0, LTE (optional), 2 x USB 2.0 ports, Mini DisplayPort, SD card slot, 720p HD camera with three microphones for noise cancellation and 59 Wh battery with 5 hours of active use. The Chromebook Pixel will be sold in two models. The standard model will set you back by $1,299/£1,049 whereas the LTE model will set you back by $1,449 (US only). You get 1TB Google Drive cloud storage for three year along with 12 free sessions of GoGo Inflight Internet with both models. On the LTE model, you also get 100 MB/month for 2 years of mobile broadband from Verizon Wireless. The Chromebook Pixel is now on sale in US and UK on the Google Play Store and will soon be available on BestBuy.com.